Like many other towns and cities across the UK Halifax is home to a number of refugee and asylum-seeker families who have been forced to leave their homeland and find sanctuary elsewhere. Many of these people (including their children) are struggling to come to terms with the enormity of what has happened to them: the harrowing journeys, the strange new language and culture: the political uncertainty many families live with on a daily basis. Building on our work with Afghan boys Naj and Bashir, we wanted to see if our creative approach could offer some solace to these families, and to see if helping them share their story with a wider audience could impact positively on their sense of ‘belonging’. We began by working with staff at Beech Hill Primary School – who we have developed a successful working relationship with. We set up a small group for refugee parents who have children attending the school. Sharon from verd de gris spent time with this group initially gaining trust and listening to their stories, their fears and concerns, in a bid to gain a greater understanding of how their lives had been so dramatically changed. The sessions were mainly reminiscence but Sharon researched Kurdish song / music and brought these in to share. At the same time, we met with staff and students at Calder High School CHS who had expressed an interest in our ‘5000 Miles’ project work. Teaching staff wanted to develop something similarly creative with us around the theme of ‘migration’. We brought their group of Yr 10 students to meet with Naj & Bashir – to explore opportunities for collaboration. Both parties had a strong interest in music and recorded sound. The ‘5000 Miles’ soundscape became a starting point for creative exchange. We also began working with Performing Arts students at Calderdale College, building on an existing links we had established with the College in Yr II. We were interested in weaving together different creative elements and began by inviting some of the refugee families from Beech Hill into the College to meet the drama students. The students took inspiration from this meeting and the refugees’ memories and stories and began to work with us on devising a performance piece telling a story of migration and ‘flight from fear’. 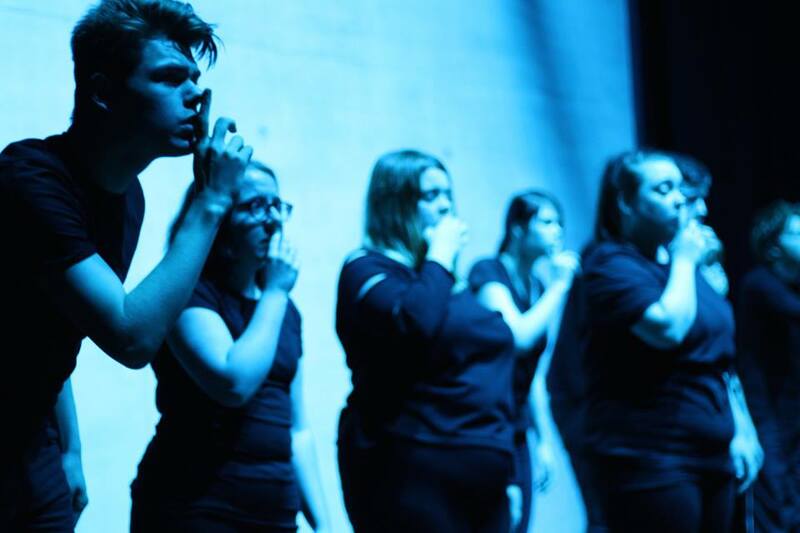 Creative director Sharon Marsden, choreographer Natalie Speake and cellist Helen Thatcher then rehearsed with the school and college students to devise a performance piece which we hoped would ‘connect’ an audience with the refugees’ experiences. As part of our outreach work we approached a number of local organisations that support refugees and asylum seekers, inviting them to join us for the performance event at Square Chapel Arts. However, building an audience for the piece was exceptionally difficult. None of the refugees who came to see the final piece had any experience or understanding of ‘theatre’ or knew what to expect. We are very grateful to Calderdale College ESOL staff who took a risk and brought many young refugees to watch the performance. 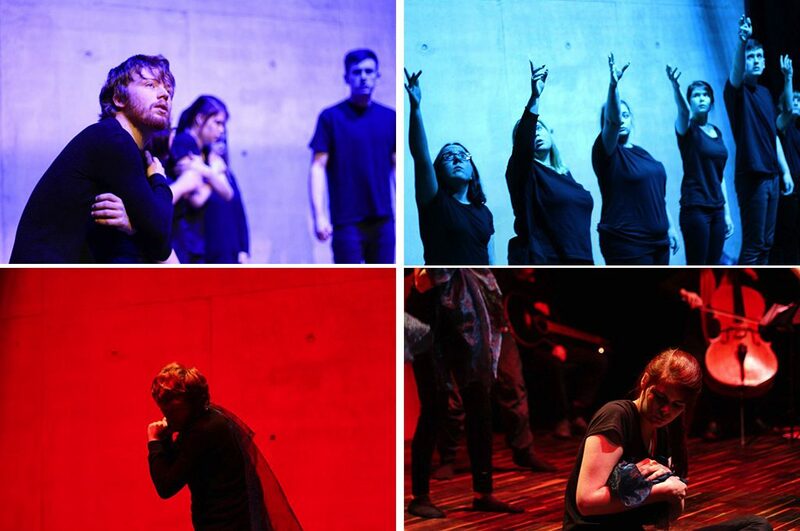 The final performance took place at Square Chapel Arts in November 2017 to a packed audience. The College students performed to a backing soundtrack devised by the CHS students. Cellist Helen Thatcher provided a ‘live’ element to the soundscape. The performance was followed by a Q&A led by Sharon from verd de gris. Thoughts and feedback were gathered through monitoring forms and questionnaires. This work is part of Creative Communities, an outreach programme led by Square Chapel in partnership with verd de gris Ltd and Orange Box young people’s centre, using the arts as a tool to bring about changes in people’s lives. Creative Communities is supported with a grant from The National Lottery through the Big Lottery Fund.